We really enjoy Italian restaurants in Las Vegas. In fact Italian food is one of our favorites. We keep trying to find new ones and really enjoy the spaghetti and Kobe meatballs at Fiamma at the MGM Grand. Below are a collection of our favorites and some you have seen it. 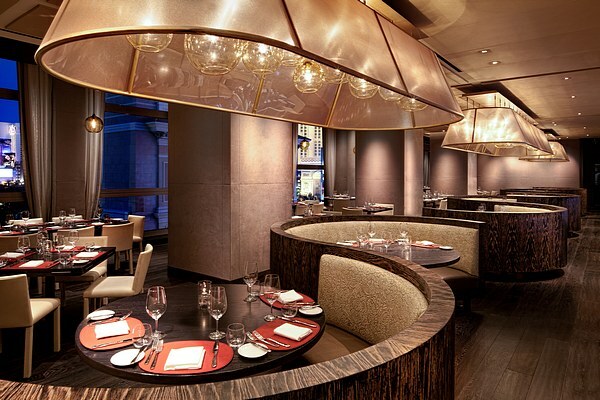 We also enjoyed Scarpetta in the Cosmopolitan when we were in Las Vegas for our Annual April trip to Vegas. The food was amazing and the view of the Bellagio fountains was incredible! Funnily enough, our favorite part was the bread! Our waiter was kind enough to keep a steady flow of their salami and cheese bread throughout our meal. It was incredible, in fact when we go back to the Cosmopolitan, we may just go for drinks and this bread at the bar! Almond Crusted Turbot at Scarpetta - Our New Favorite Las Vegas Italian Restaurant. If you are looking for a great slice of New York Style Pizza, go look for the hole in the wall at the Cosmopolitan on the Strip. I can't tell you the name of it as it doesn't have a name, but it is the best slice of pizza at 1 am you will find in Vegas! We found it by accident on our first stay at the Cosmopolitan, a security guard asked if we had tried it yet. He then challenged us to find it. (look for a random hallway with album covers on the walls across from STK on the third floor). If your favorite is not listed here then please feel free to add your Las Vegas restaurant reviews. We are always looking for new restaurants to try in Las Vegas! 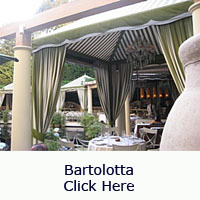 Bartolotta specializes is Italian Coastal Cuisine and is located in the Wynn. It is pricey, but we really enjoyed our meal and our evening here. Wolfgang Puck's awesome Italian restaurant in the Caesar's Palace Forum Shops. It is one of our Las Vegas Restaurant Pizza recommendations. 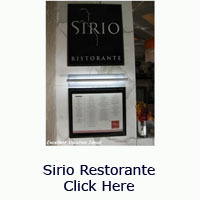 Sirio Restorante at the Las Vegas City Center is our ABSOLUTE favorite Italian restaurants in Las Vegas. Check out our review to see our experience. 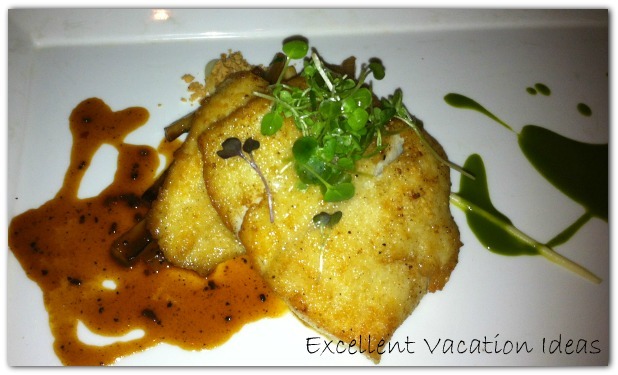 In October of 2011 we tried B&B Ristorante at the Venetian. It is Chef Mario Batali's restaurant, you know the guy with the orange crocs! It was fantastic. Look for our review soon. 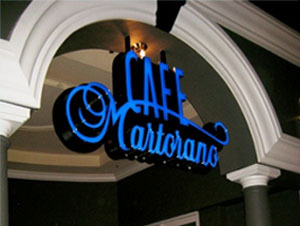 "The Cafe Martorano has the best Italian Food around! This is a great FUN evening of music, movies and wonderful food! Hey, you can even dance if you want, there's plenty of room and the music will GROOVE you! Dress as you like, reservations welcome, they get lots of big groups but I can tell you that the SERVICE is always HIGH LEVEL! I saw the owner at a cooking demonstration in The Fashion Show Mall on the Strip and went there for dinner later that night. This is good home cooking...The BEST meatballs ever! Great starter! Oh and chicken wings...YES! I'm a big fan of the wings! Ok, then the macaroni & cheese...yummy! The shrimp scampi is out of sight, BIG shrimp! Oh, and since the owner is from Philly, you can't leave without trying the cheesesteak! Then there's the Sausage and Beans with Escarole...Need I go on? Ok, just one more thing, try the Grilled Veal Chop...melt in your mouth! I hear there's a place in Florida...I'm there as soon as I can!" Check out the reviews of Cafe Martorano at Tripadvisor. Located in the Rio Suites Hotel and Casino, off strip. It doesn't look like your typical fine dining experience, but it does look like alot of fun! 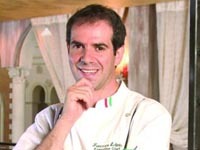 Chef Francesco Shintu is a Master Chef (the youngest in the world) of the true Italian pedigree. My favorite part about visiting Zefferino's is asking him to suprise me. He'll ask for a protein, vegetable, allergies or dislikes, and then disappears into the kitchen to whip up a wonderful treat. You have to give him a gauge as to how hungry you are or the tasting menu will go one forever! I love his pumpklin ravioli, and Zuppe del Doge, but everything is based on "in season" so be ready. The Sunday Brunch is out of this world, but again, go hungry. I am a true Las Vegas FOD; www.reservationsreq.com and author of Reservations required, Culinary Secrets of Las Vegas Celebrity Chefs. Bon Appetit. " Zefferinos is located in the Grand Canal Shoppes and the Master Chef, Chef Francesco Shintu, will treat you to wonderful dishes prepared based on "what's in season".